With the NBA lockout finally over, the NBA will hold an abbreviated pre-season before embarking on an abbreviated season that will get underway on Christmas day. The last time we left the San Antonio Spurs, they had just finished up a successful regular season (division champs) with a most unsuccessful post-season (1st round exit to the Grizzlies). How successful was last year’s regular season? The team won just under 75% of their games, 74.4 to be exact, making it the most successful season in terms of winning percentage since 2005-6. Unfortunately, the 4-2 series loss to the upstart Grizzlies erased most of the good memories of the regular season. Looking forward to this year, most of the major parts of the team are back for another go-around. One missing cog is Antonio McDyess, who was put on waivers and then retired. The major pieces, however, are still in silver and black. Ginobili, Duncan, and Parker will be joined by a new face in rookie Kawhi Leonard, a long, raw defensive specialist that looks to battle with Richard Jefferson for minutes throughout the season. 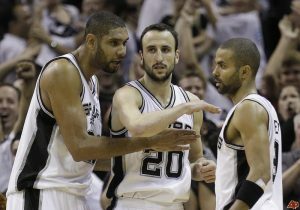 What does the season portend for the Spurs? Well, the Big Three aren’t getting any younger, and with the league deciding to squeeze in as many games as possible, the demands of the schedule may take a toll on the Spurs’ veteran players. On the bright side, the Spurs do have more promising young stars that can take some of the burden off. If Tiago Splitter can continue to develop along with DeJuan Blair, then Tim Duncan might be able to play fewer minutes and get a night off every once in a while. This year will be an interesting year for the NBA with the shortened season, but could work out well for veteran teams like the Spurs. Will those teams who return their core players have an advantage over younger, more inexperience teams that might take longer to come together? Or will the grind of the season wear down the older teams? Only time will tell, and with the season set to kick off in just a few days, we won’t have long to wait. Call for all your San Antonio Real Estate needs. Visit my website for the best San Antonio Online Homesearch.